Shipping minor items rarely requires more than crumpled newspaper, leftover packaging peanuts or bubble wrap if you want to be extra cautious. These materials are a great way to get non-fragile items from one place to another, affordably. More delicate materials, however, create a different kind of issue. Picking the type of material for packaging, buying it, then finding the balance between too much packaging and not enough can create anxiety not normally associated with something as innocuous as the packaging of a product. To take the hassle and guesswork out of these kinds of situations, The Foam Factory stocks Pick and Pull Grid foam, a do-it-yourself packaging material that keeps materials safe at an affordable price. With the shipping security of a top-quality foam material without the cost of custom design fees or cutting labor, Pick and Pull Grid is the best of both worlds. Made of open-cell foam, these perforated sheets allow the user to easily separate the ½ inch squares by hand to create special packaging for products to be shipped or stored. 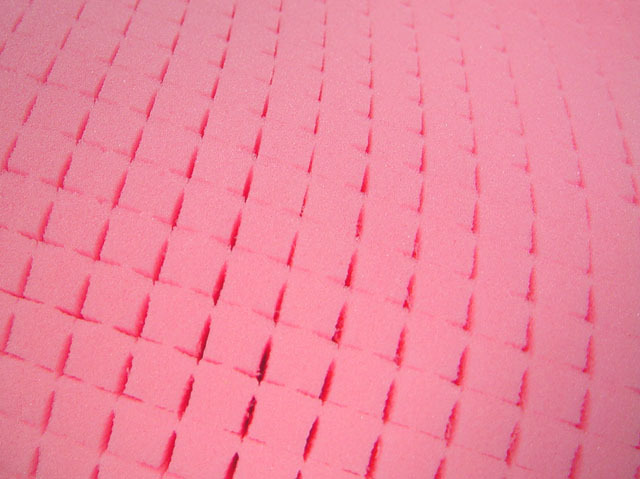 Available in standard charcoal and pink Anti-Static foam, Pick and Pull Grid can also be custom made from 12 colors of Class A rated fire retardant foam for special uses where appearance is as vital as security. Increasing its versatility, Pick and Pull Grid is available in thicknesses from ½ of an inch up to 3 inches. This supportive but flexible packaging can also house irregularly shaped or contoured products by layering thinner sheets of the material. This way, different amounts of foam can be removed from different layers to support deeper products that don’t have flat or even sides and shapes. Along with the perforated Pick and Pull Grid sheets, The Foam Factory has solid base sheets of foam and convoluted/eggcrate lid layers to provide a full 360 degrees of protection for an item. These equally affordable packaging materials take the guesswork out of how to ship items by minimizing their ability to move in transit, one of the most vital aspects in keeping a product safe. Pick and Pull Grid is designed to be easy enough for anyone to design, but practical enough to make it an excellent solution for packaging and storage applications. No tools besides your fingers are needed to trim the foam, nor is any mechanical or technical experience. Pick and Pull Grid is as easy as placing the item to be secured on top of the form, inserting pins or toothpicks along the outside of the object or tracing it to create an outline of the shape. After the outline is marked, the foam can either be carefully cut with a knife or pulled apart by hand, being sure to always take the inside perforation line in relation to the tracing. The only rule to using Pick and Pull Grid is to leave slightly less room than the object’s true dimensions so it can snugly hold the object, as the foam will easily compress to allow the item into the space. Once removed, Pick and Pull Grid squares cannot be reattached, so it is best to err on the tighter side of designs. In addition to its proficiency at safely shipping items, Pick and Pull Grid is also an excellent economical casing material for delicate or sensitive items that require transportation. Security items like a camera case, firearm case or even the containers for fragile holiday ornaments can be stored and transported safely with Pick and Pull Grid foam. 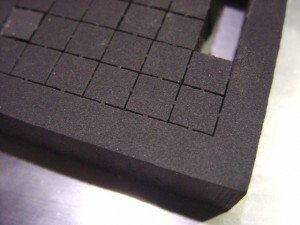 For electronic items, The Foam Factory’s Anti-Static Pick and Pull Grid foam can dissipate the electro-static charges generated while being moved and handled. Delicate and expensive circuit boards, desktop or laptop computers and recording equipment can all be kept safe while in transport or storage by this unique, pink foam. One of the most popular transportation methods for sensitive or important products is the security case. Often purchased as a set, these will contain a durable shell with interior base, lid, and Pick and Pull Grid foam layers. If any of these interior sections of foam are trimmed to size incorrectly, damaged in use or wear out, ordering a replacement is often expensive and results in more materials than you need, since they are normally sold in sets consisting of all three layers. With the Pick and Pull Grid section receiving the majority of the wear, these are typically the only sections in cases that ever need to be replaced. The Foam Factory offers single-sheet replacement to re-outfit your custom case affordably by providing you with only the materials you want, saving you money. Whether it’s going from New York to California or from your living room to the basement, making sure an item is in the same condition coming out of the box as it was going in is your main priority. The same goes for the delicate personal-use items we bring along with us every day, like cameras, testing equipment or computers. Form-fit foam padding can help make sure that no matter why you’re packing something up, it will stay safe until it is opened again. 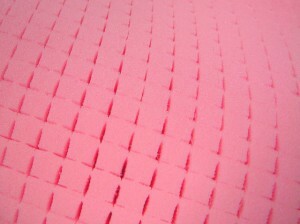 And with The Foam Factory’s Pick and Pull Grid foams, you can get individualized security quickly and affordably. I am interested in acquiring some of this type of foam. I would need a quote and is there a minumum order? Include pricing for several different thicknesses. Thanks for your inquiry. We’ve sent your request to our customer service team who should be getting back to you soon. Just so you know now, we have no minimum order for our Pick and Pluck foam, both for the charcoal and Anti-Static varieties. There is also no minimum size the sheet needs to be cut to, as we can customize that as well. We’ll be happy to answer any other questions you have, whether it’s here or through phone or e-mail via our Contact Us page! Do you ship to Canada or do you have a Canadian outlet I could contact? Yes, we ship to Canada. Please contact us for more details. Do you guys send free samples as well or it has to be a purchase? We do have free samples available. However, international customers will need to pay for shipping of the free samples. Please contact us for more information.